commitments remaining in effect that were made in docketed licensing correspondence such as licensee responses to NRC bulletins, generic letters, and enforcement actions, as well as licensee commitments documented in NRC safety evaluations or licensee event reports. But because the NRC neither defines “commitment” in its procedures nor trains its workers about “commitments,” the term means different things to different people.According to the OIG, 73% of the NRC staffers it interviewed thought that the agency’s regulatory decisions could not be based on commitments, while 27% thought they could. It matters little which camp is right, for neither 73% nor 27% should be considered a passing grade when it comes to nuclear safety. The OIG also reported that 76% of the people it interviewed at the NRC, in the industry, and among public interest groups thought that commitments were not enforceable by the NRC; 24% of the interviewees thought that commitments were enforceable. Again, an effective regulator would have consensus among its staff about whether a promise made in writing to the NRC warranted enforcement action when broken. Some NRC staffers told the OIG’s auditors that they thought about two classes of commitments: “big C” and “small C” commitments. One NRC project manager explained to OIG that “big C” commitments are “safety-significant commitments that could become an obligation or condition of the license.” Parsing the vague and undefined term “commitment” into two or more vaguer and equally undefined terms is either Stupid or stupid, your piCk. Now for the punch line: the NRC conducts inspections every three years at each nuclear plant of each plant’s commitments. That’s right – the agency that does not know what a commitment is and whether one, if found, is enforceable invests time every three years on commitment scavenger hunts. How do NRC inspectors assemble the commitment listings they then wander around plants hoping to substantiate? The OIG found that 40% of them only use the agency’s ADAMS electronic library to find commitments. 20% use self-generated lists of commitments. 15% use ADAMS and self-generation. And 15% use ADAMS and commitments provided by the plant owners. In that last category, any plant owner who provided the NRC with commitment(s) it is not meeting would be guilty of breaking promises and also of being dumber than dirt – or at least dumber than an allegedly independent regulator who would ask the plant for what it should grade. The OIG also discovered widely disparate means of conducting these commitment scavenger hunts. Some are conducted at the plants themselves while others are performed at NRC’s headquarters in Rockville, Maryland. Some inspectors verify that the actions promised in the commitments have actually been completed. Other inspectors merely check to see if the owner promises that the promised actions have been done. In sum, the NRC’s performance regarding commitments made by plant owners ranges between pathetic and Pathetic. For example, the owner of the Davis-Besse nuclear plant committed, under oath, to the NRC by letter dated May 27, 1988, to implement a boric acid corrosion control program to protect safety equipment from damage caused by borated water. After leaking borated water caused extensive damage to the pressurizer spray valve RC-2, the owner re-committed to the NRC by letter dated July 1, 1999, to implement a boric acid corrosion control program. The owner failed to honor its commitments. And the NRC failed to notice, and perhaps to care. 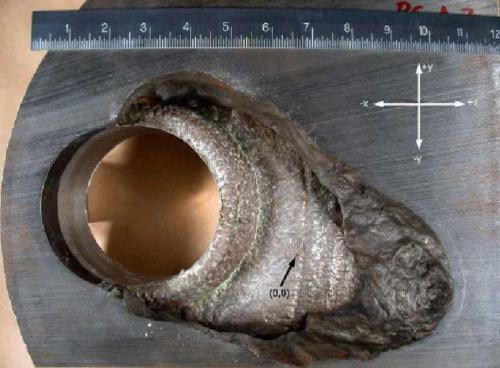 Leakage of borated water over a period of years corroded away more than six inches of the metal head of the reactor pressure vessel at Davis Besse, exposing the stainless steel inner-liner. The image at the top of the post graphically shows what can happen when commitments are merely empty promises. By the NRC’s own assessments, Davis-Besse came closer to nuclear disaster than any other U.S. reactor since the March 1979 partial meltdown at Three Mile Island. There are millions of reasons for the NRC to take commitments seriously: the Americans living within 10 miles of operating nuclear power plants.